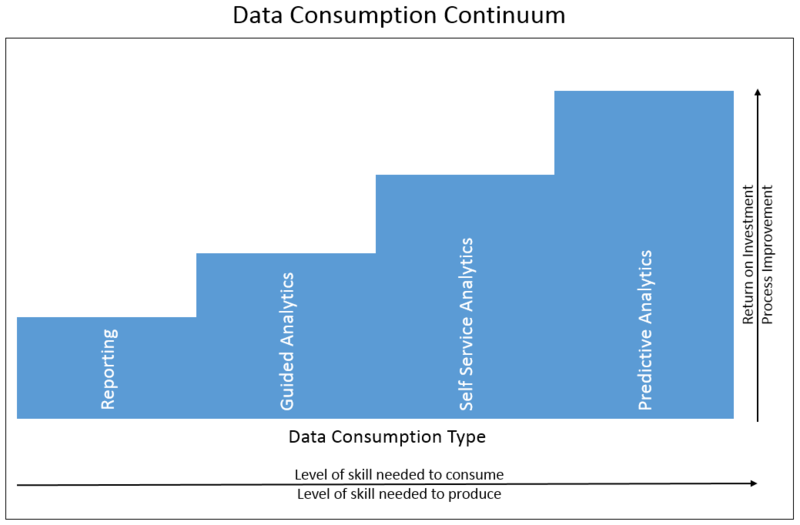 As this is intended to be a blog about visualization it seemed only fitting that I devote this post to visualizing the concept I introduced last week that I called a Data Consumption Continuum. A few years ago my good friend and colleague at the time at Northeast Georgia Health System, Zach Ivie, helped me solidify a visual very close to the following. Despite the fact that this is a rather crude version of the work of art that Zach, a graphic guru, helped produce, I believe the message will come across loud and clear anyway. 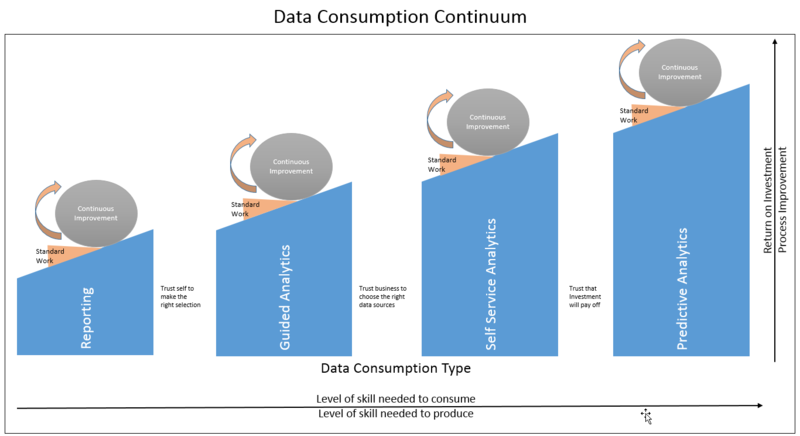 That message is that as you move through the Data Consumption Continuum there is a higher level of skill demanded of both the data consumer and the data producer. However, the benefit to the company of making those investments is clearly that there is a higher level of return on investment as well as a higher level of process improvement that can be achieved. 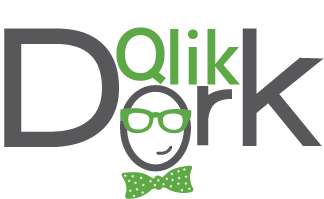 I presented the graphic when I spoke at the 2014 Qlik World Users Conference in Orlando. I liked the implications that their suggestion implied. Clearly we should never be standing still and that even the stages of the Data Consumption Continuum are in fact a process. 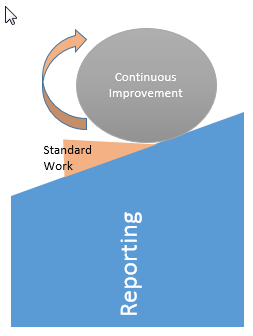 That the hard work I indicated could be visualized as a ball rolling forward, and that there should be documentation supporting the standard work after advances are made. So I adjusted my thinking to include their great thinking and suggestions along with my basic premise that the different stages required a knowing decisions. The stages of the Data Consumption Continuum require ever increasing levels of trust. Combining the thoughts provided room for annotations to note exactly what I believe those commitments are: Ever increasing levels of trust. There are clearly static reports that are simply needed as “checklists” for workflows. However, there are also thousands more developed simply so that business data consumers can avoid having to accept any responsibility. It’s easy to say “I took off the report that Dalton built for me. Clearly he did it wrong.” Which is also ok with me because I can say “Clearly they gave me bad requirements.” Thus the proliferation of 18 versions of the truth continues. Moving to Guided Analytics forces those data consumers to accept the responsibility for making selections filtering the data they are then responsible for the choices they make. Which only makes sense as they know their business better than IT and a lot is missed in writing up requirements documents. As you are probably well aware from experience getting others to accept responsibility is easier said than done. One of the great pleasures in my search for more effective ways to communicate and be the catalyst for change is the identification of others in different fields who are also working tirelessly to train up. Others who continually reiterate and show examples to help crack my think skull. One such field that I’m trying to hone my skills in is Storytelling. Cole Nussbaumer is one of those afore mentioned people that I love learning from on an ongoing basis. I’ve always been a self-professed data nerd and was always of the mind “For crying out loud the data speaks for itself.” Cole has helped me realize that’s not even close to reality in the field of Business Intelligence. Her blog conveniently named for people like me Storytelling With Data is a resource I’ve referred to many times. She backs up her pontificating through examples to show the flow through projects. For me seeing a visual as a starting point then seeing it progress forward using her techniques step by step has really helped me understand the value of storytelling and more importantly how to do it. But how does this relate to this post? Well if you give me a second I’m getting to that part of the “story.” I’ve begun realizing that Actionable Intelligence requires not only the data and visuals but storytelling to explain things so that executives fully understand the ramifications. 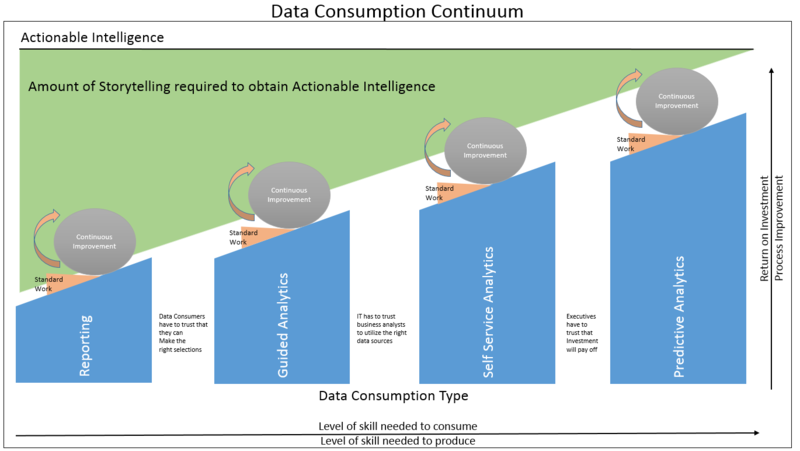 Thusly I present my current approach of Visualizing the Data Consumption Continuum. This entry was posted in Data Literacy, Training, User Adoption, Visualization and tagged Actionable Intelligence, cole nussbaumer, consumer, data consumption, marcello zottolo, Storytelling, zach ivie. Bookmark the permalink.